Jeff told Barbara Ann that they were flying, and we hustled over to that wetland section in the Audubon center in Jamestown, New York. I scored one of my most favorite images there, some 2 years before. A very fresh Baltimore, with full display of its magnificent dorsal wing surface, plus the red-top on the head, the Sunkist-orange antennae clubs and the strong black and white spotting on the abdomen. 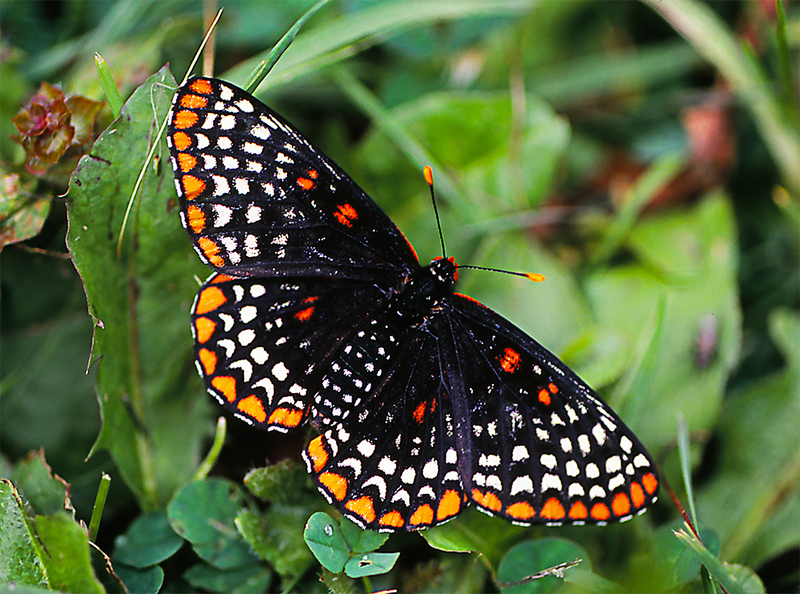 When we reached the wetland area, I was tickled pink, for there they were, a fresh flight of Baltimore Checkerspot butterflies. The Audubon center planted the Baltimore’s hostplant, Turtlehead, and the appearance of the Baltimores was a joyful success. It’s always the same, you search for and find Baltimores, and before you shoot away, you stare at them, hard and long. Their coloration and color pattern are near magical, design and color selected to amaze. Sitting here at my iMac computer with its 27″ screen, and just out my window, here in central. Georgia what do I see? Cloudless Sulphur butterflies flying, seriously visiting the few native flowers in my November 22nd garden. I’m pleased, very. I have so much to be Thankful for, my birthday just 6 days away. My family has its health, I have this, my strong, fulfilling interest, and, and 2019 beckons, calls to me. I am ready, willing and able to scour 2019 fens, meadows, marshes, medium mountains, swamps and such to find new and beautiful butterflies. Thank Y-u for That. You’re seeing one of my top favorites images, a Baltimore Checkerspot butterfly seen at the Audubon Community Nature Center in Jamestown, New York. I very much want to enjoy such moments again, want 2019 to be a Bust-Out year for Boy Brooklyn. So my impetuous mind is accelerating to the possible trips I’d love to make, with my brain trying hard to hit the brakes gently, with practical considerations galore. I keep thinking Big Bend Wildlife Management Area in the Florida Panhandle. Lynx Prairie and Kamamama Prairie in Adams County, Ohio. Harris Neck National Wildlife Refuge on the Georgia coast. Okefenokee Swamp here in Georgia. The Lower Rio Grande Valley in Texas. All this telescoping ahead teases with other Wow! possibilities = Why not travel to find those Very Very rare butterflies that I’ve day dreamed of seeing for these many years: A very rare Satyr in Alabama; Pyle’s beloved Magdalena Alpine; the Bog Fritillary up north, a slew of Metalmarks; those Buckwheat loving Blues; the Sonoran Blue and a bunch of western USA Coppers. Thanksgiving Day. A day to consider what you have to be Thankful for, a for such as us, a day to dream of future meet-ups with G-d’s winged beauties. We’ve grown. An increasing number of folks now follow wingedbeauty.com. Well, China, South America and Africa still lag behind in those who follow us here, but they are more than offset by our increased reach here in the United States, in Europe, Canada, the Middle East, Australia, Japan, and much of the Far East (Vietnam, Japan, Korea, Sri Lanka). I am so very pleased with knowing that friends from so far afield come to visit, and return again and again. Growth here at home and abroad comes with interesting challenges. Many come along, and then share their own image captures. It doesn’t take more than a nanosecond for me to recall the images that I was scoring as many as 20 years ago. They were done with such determination, zeal and, absent in the field mentors, enough well, confusion, to make me shudder at how much I wanted to get OMG! looks, and how far I was from doing that, regularly. A new friend arrived from Sri Lanka, very interested and very appreciative of whatever advice I might share. Share too much, and you risk overwhelming, share nothing at all, and me, I know how that vacuum feels. So I return to one of my most valued images, this Baltimore Checkerspot butterfly, met at the Jamestown (NY) Audubon Center, before it’s name changed. This look tickles me a lot, for it gives you a whole host of this beauty’s beauty, from wingtip to wingtip, from palps to posterior end of its abdomen, and then those antennae, the head, eyes, the color sings too, as do the distinct markings that I’ve noted challenge Tiffany’s and Cartier and the living and long gone artisans of those jewelry workshops. A favorite image, I ask, how many ‘standing ovations’ must it give you? How I’d Love to know your responses to this last query??? Peggy, Kelly, Virginia, Holly, Cathy, Jim, Sherrie, Katarzyna, Ian, Phyllis, Laurence, Angela, Lois ,Jim, Kathryn, Marcie, Kathy, Jill, Leslie, Paula, Barbara Ann . . . .